Today you’re going to understand exactly how the NASA shutdown affects government employees and contractors in 2019. Specifically I’ll show you what it means to be exempted, excepted, and furloughed. So if you are looking to pursue a long-term career at NASA, you’ll definitely need to read this. 1. Why does NASA Shutdown? 2. What happens to NASA Engineers and Astronauts during a government partial shutdown? 3. Can Civil Servants go on Vacation? 4. How easy would it be for a NASA engineer to hop onto other jobs while being furloughed? Welcome folks! I’m your host Aida Yoguely. Today’s topic is the NASA Partial Shutdown. But first off, I’d like to acknowledge my first one thousand subscribers on YouTube.com/Yoguely, thank you very much! ¡Muchas gracias! Now let’s get started. So, I’m an engineer by training and I have a long history at NASA. That’s me (image above) at my first welding lesson in the machine shop. And just recently NASA was partially shutdown for the longest time in history, 35 days. Wow! It’s a new record! 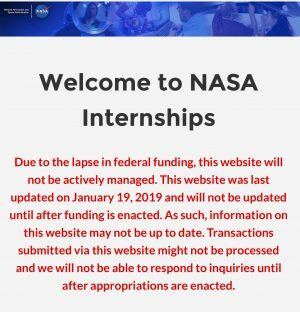 If you were looking to apply for internships with NASA, you may have seen the notice on their website stating the website is not being actively managed (Partial Shutdown) due to the “lapse in federal funding”. This is because NASA is an agency of the United States Federal Government. 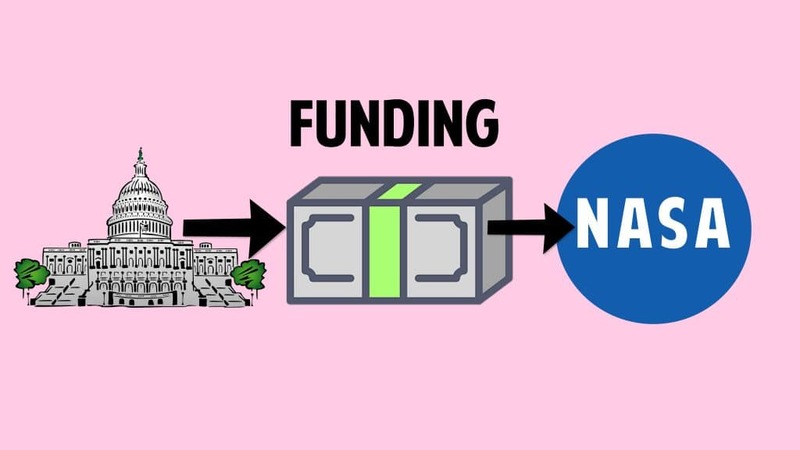 As a government agency, NASA receives its funding, the money necessary to keep its operations running, from government funds. And the group of officials who vote to approve the budget, the estimate of revenue and expenses, are those in the US Congress. When these lawmakers have not yet agreed on a budget for this new year, then agencies and operations that are considered non-essential of the U.S. government, those close down. what happens to the Astronauts up in space during a government partial shutdown? From my experience getting caught in a NASA partial shutdown, I can tell you that one of 3 things can happen to a NASA government employee. Civil servants could be placed on exempted status, an excepted status, or furloughed status. This depends on previously approved budgets and on how essential the work is. The exempted employees are those who are working on projects with already approved budgets during a partial shutdown. For them, they get paid to work. Thus, they get placed on a pay and duty status. Usually, an engineer will be juggling multiple projects. Only some of which could have pre-approved budgets for say another month or so. In a case like that, the engineer might be permitted to work remotely, on call and perhaps up to half-time until the budget runs out. The second possibility during a partial shutdown is for the employee to be excepted, in other words they are “essential” for operations and they are required to work-without-pay. They are placed on a non-pay and duty status. What constitutes as essential is doing work that prevents imminent threats to human life or doing work to protect property. The amount of time at work would be kept to a minimal as necessary. It could be full-time, part-time, or an engineer might need to be accessible on call. This is probably one of the toughest situations because NASA employees are required to show up to work but without any income stream. Thus, it doesn’t leave enough time for the excepted employee to get a second job as a backup source of income. In the positive side, these employees would get paid for their work done but only after the partial shutdown is over. 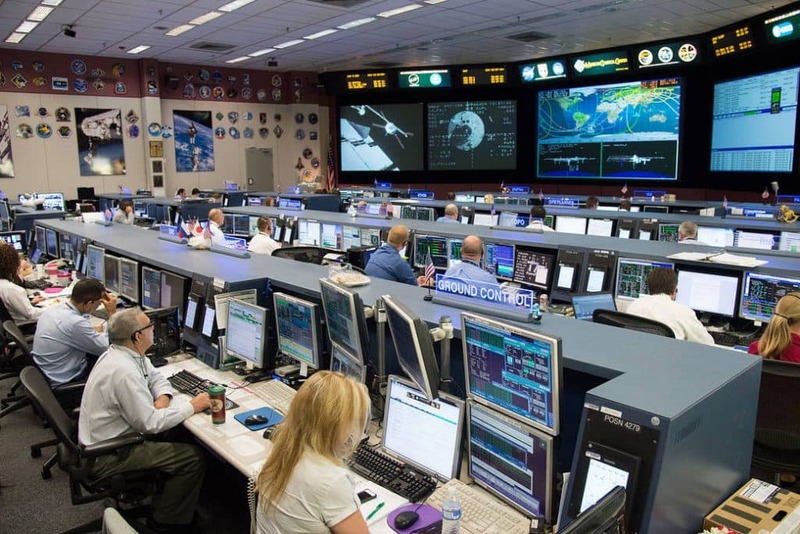 Excepted folks include those who work in the Flight Operations Directorate, those in the Mission Control Room who are operating the International Space Station, tracking it on orbit, and keeping the Astronaut crew safe. With their support, Astronauts can continue to conduct science experiments and go about their daily scheduled events. Lastly, civil servants who are working on “non-essential” projects get Furloughed. 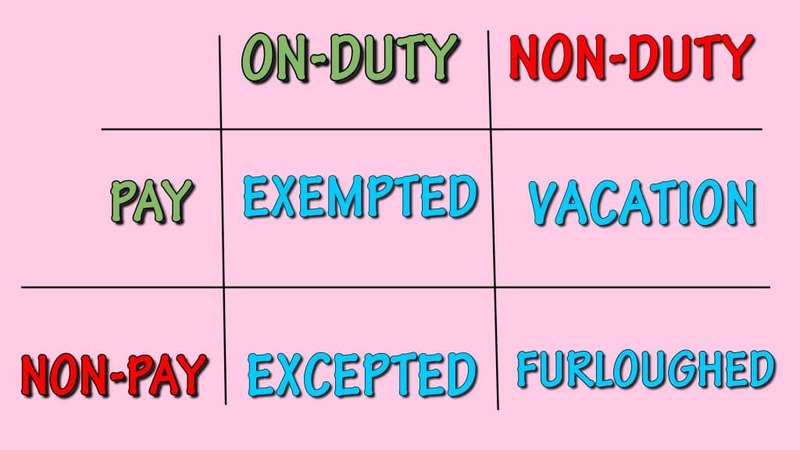 They are placed on nonduty, non-pay status, similar to leave-without-pay. Being furloughed means they are not allowed to work, use the office, access NASA email accounts or voicemail. That is unless they are furloughed but on-call. Some of the people that gets furloughed includes new-hires, the education, outreach, and public affairs office. And even engineers working on technologies that don’t require immediate attention. Can Civil Servants go on Vacation? What about being on leave-with-pay? This is technically vacation status and since getting a paid vacation involves spending government funds for what is a “non-essential” activity, then it is not allowed. Meanwhile there is yet no bill for federal contractors. So, there is yet no guarantee that federal contractors would get back pay for paychecks they missed during the shutdown. How easy would it be for a NASA engineer to hop onto other jobs while being furloughed? Civil servants are permitted to take other jobs, moonlighting is allowed, however there is one law they got to be very careful not to break, that is the “Federal Conflict of Interest Law”. 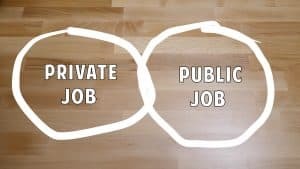 Basically, the outside “private” job must not conflict with the federal, “public” job. To be on the safe side, it’s always best to get ethics advice. But since those in the ethics office might also be furloughed then it’s quite risky to start an outside job without official approval. While being a NASA Civil Servant government employee is praised for its long-term financial and job security, it can have gaps in budget funding from time to time. And those weeks without a paycheck can put folks in a difficult situation where they have to reach into their emergency savings funds. 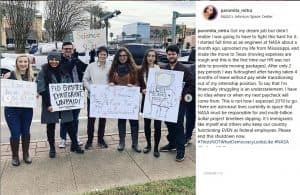 On January 15th, 2019, my friends at the NASA Johnson Space Center were out protesting the government shutdown. Some of the brightest minds in the aerospace field just want to get back to work and DO science. With this being now the longest shutdown in the history of the United States, folks have had the time to reflect on past job offers and even the higher pay that they turned down for the expectation of more stability. If you are looking into a long-term career working as a civil servant or as a contractor working for the federal government, this is something to definitely be aware of and be prepared for. One, understand who is funding your job. And two, always have an emergency savings fund! Or join the discussion in the Community Forum.